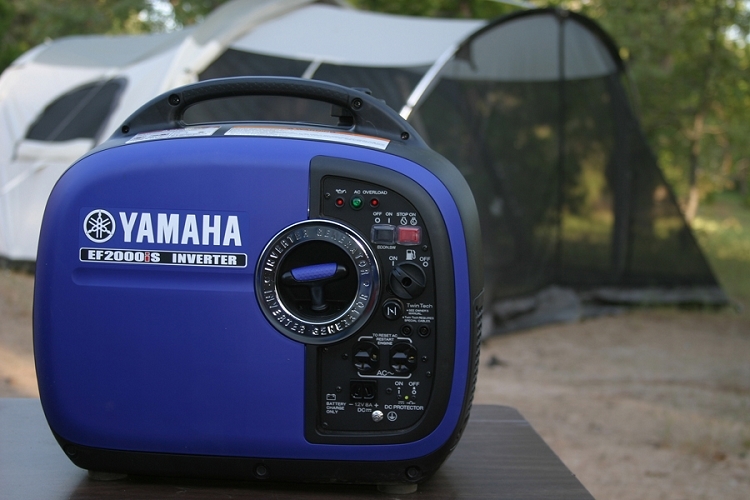 It's clean, quiet and it's so versatile you can connect two EF2000iS's to make 3600 watts of power. This model uses Yamaha's powerful 79cc overhead valve engine, and contains all the latest Yamaha Inverted technology and puts out 2000 maximum watts of clean, pure power and weighs just over 44 pounds. Note: A valid drivers license image will be required for the purchase of this unit matching the shipping address before this item will be shipped out. Super-quiet muffler with USFS-approved spark arrestor only 51.5 dBA at 1/4 load and eliminates errant sparks. Compact 2.2 cu.ft. size is easy to store and transport. Hook up two EF2000iSv2’s for 3600 watts, 30 amps of maximum power (requires accessory cable available at extra cost). Smart Throttle varies engine speed based on load which improves fuel economy and reduces noise. Inverter system with Pulse Width Modulation (PWM) control produces a pure sine wave to run products with built-in microcomputers or microcomputer-controlled electric tools. Oil Watch Warning system prevents engine damage caused by low oil, avoiding costly repairs and minimizing down time, adding customer confidence and peace of mind. Fuel gauge so you can see your fuel level at-a-glance. Auto warm-up increases engine speed during cold starts to handle high power demand appliances right away. Rubber vibration isolation feet for smooth operation and noise reduction. Advanced programming allows the v2 the ability to power a much wider range of applications. Dimensions: 19.3" x 11.0" x 17.9"
Just got my generator from you folks and you were quite a bit cheaper than the 1400 bucks from the Yamaha place here next to us. Thanks and it got here in 2 days, so I really appreciate the fast shipping and it being free to. Thank you.